So who wouldn't want a Las Vegas Wedding with all the glittering lights, top name entertainment and of course, a chance to win the jackpot? More and more brides are choosing destination weddings and Las Vegas is one happening place for a celebration. If you're planning an outdoor wedding in Las Vegas, above all, you need to be acquainted with the weather in Las Vegas at the time of your marriage. It rarely rains or snows in Las Vegas however, June, July, August and early September are unbearably hot and you and your guests will likely feel like a wilted, energy less flower. On the other hand - March, April, May, October see temperatures that are quite comfortable. It could be a little chilly in November, December, January and February. With that in mind, if you're hosting a small guest list, check out the Bellagio Hotel, located on the Strip. Enjoy the outdoor ambiance of the Terrazza Di Sogna which can accommodate up to 34 guests. You will truly feel like you're at Lake Como, Italy. You and your guests will be mesmerized as you watch the Fountains "dance." For a larger venue take a look at the "Lakeside Center" one of Las Vegas' most charming properties located on the shores of Lake Jacqueline in the Desert Shores of Summerlin. This venue accommodates up to 200 guests. If you've dreamed of a destination wedding in Italy but your budget just couldn't afford the travel expense, consider discovering the opulence of The Venetian Hotel where you will unite the storybook charm of Italy with a destination a little closer to home. The Venetian offers a team of talented planners who will attend to every detail and make your wedding day truly memorable. After your reception has ended take advantage of staying in this magnificent hotel and enjoy all the amenities of The Venetian. Contact them at 866 548-1807. If you're not into glitz and glam, just 20 miles from Las Vegas, Mother Nature puts on a show to compete with any Vegas performance at the Red Rock Canyon National Conservation area. The pinnacles and boulders range in color from deep red to white. 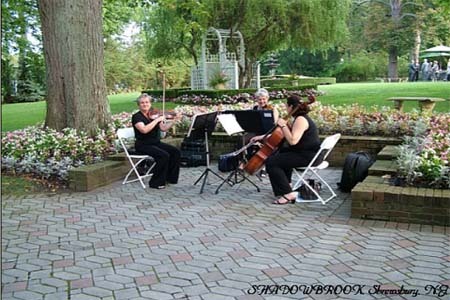 The breathtaking views are a perfect backdrop for any wedding. Call the Red Rock Canyon National Conservation Area (702) 363-1921 for information and details on hosting your celebration in this magnificent area. Imagine meandering down a winding path and soaking in your cherished wedding while overlooking a serene lake in your private paradise. Your guests will enjoy exquisite dining, aperitifs, hors d' oeuvres, cocktails and distinct wines. All of this can be enjoyed at Rhodes Ranch Golf Club. 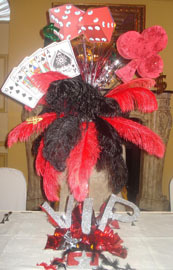 Consider this totally glitzy Las Vegas centerpiece from www.GallerysCreativeDesigns.com complete with dice, cards and feathers. I enjoy working with brides and welcome your comments. Please let me know what you think of my page on Las Vegas Outdoor Wedding and if you would like to share any pictures or thoughts, contact me and I will gladly include your comments. Magical planning ideas can be found here. Check them out!